This is my first year growing yellow pear tomatoes and I have a bajillion of them! 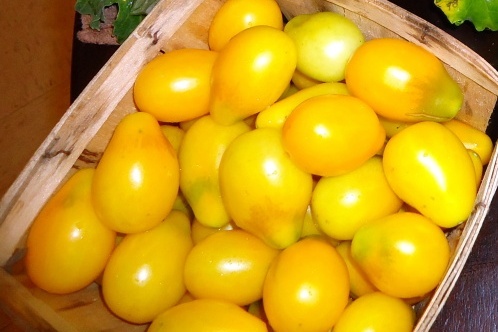 These little tomatoes are only a couple inches long and have a nice golden color. They are less acidic than red tomatoes, which gives them a more mellow, sweeter taste. They have been very prolific in my garden this year, producing far more than any of our other tomato varieties. They make a nice addition to salsas and look pretty in salads. I also dehydrated a batch and packed them in olive oil, and am looking forward to using them. My latest culinary creation utilizing my abundance of yellow pear tomatoes was jam. Now, at first when you hear "tomato jam," it may sound weird, and even kinda gross. But trust me, this jam is anything but gross! It somewhat reminds me of sweet and sour sauce, and it's got a little bit of spice to it, which I find to be absolutely delicious. You can use this jam as a topping for toast or biscuits, poured on cream cheese as a cracker spread, or a glaze for meats. Following the jam recipe, I will also have a recipe for sweet and sour chicken that I made the other night using this jam--yum! 2 Tbsp distilled white vinegar1. In a 6-quart saucepan combine the sugar and water. Bring to a boil over medium heat and simmer until the syrup reaches 234 F on a cooking thermometer. 2. Remove from the heat and add the tomatoes, mixing well. The syrup may change consistency, but continue stirring and eventually the tomatoes will mix evenly. 3. Return to heat and add the chilies, basil, lemon juice, and vinegar. Simmer, uncovered, on very low heat until the mixture thickens, about 1 1/2 - 2 hours. Stir often, being careful not to burn. The jam will darken. 4. Ladle into clean jars, leaving 1/4 inch of head space (I used the little 4 oz. jars and ended up with 6 of them, plus a tad extra that I put in the refrigerator). Cap and seal. 5. Process for 15 minutes in a boiling water-bath canner. 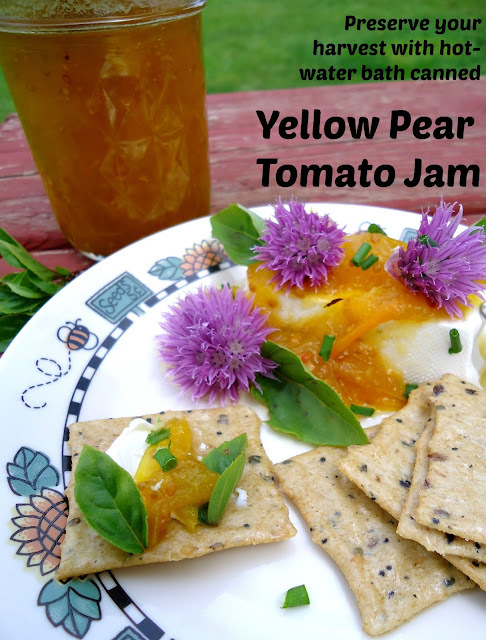 Yellow pear tomato jam on top of cream cheese, garnished with chives and basil. 1. Dredge chicken pieces in flour. 2. Heat fat in wok or large skillet on high until shimmery. Carefully add chicken pieces and stir continuously until chicken is cooked (approximately 5 minutes). Reduce heat to medium. 3. Add tomato jam, pineapple chunks, pineapple juice, and vinegar to wok. Stir well, until all ingredients are combined and the chicken is thoroughly coated. 4. Mix together the cornstarch and soy sauce. Add to the wok, stirring well. Bring to a simmer. Simmer 2-3 minutes, or until the sauce has thickened. Serve over cooked brown rice. Do you need to skin and take seeds out of the tomatoes? It is not necessary to skin or seed the tomatoes, though you could if you'd like. Being a jam, the skin and seeds just kind of blend in and do not affect the taste or quality. This jam is why I look forward to canning season. It's so yummy! I made the Yellow Pear Tomato Jam. I used about 2 cups of pear tomatoes and 4 cups of regular tomatoes. After I made it, I let it sit in the frig for a couple of days. It's a jam consistency and it has a fruity taste. You can't taste the tomatoes. It's kind of like between a nectarine or apricot and marmalade. It's good. I had it on Saltine crackers, some with and some without peanut butter. We didn't have very many pear tomatoes. I want to try it on toast. I tried a different tomato jam too. II put in all regular tomatoes, maybe a few cherry tomatoes and I didn't like it. I looked online and found out that you can put it in meatloaf. This was the one where you fried it in a skillet. Sorry, it's supposed to say:I put in all regular tomatoes... not- II put in all regular tomatoes. Also, the Yellow Pear Tomato Jam is filling. It's easy to eat too much because it's good. I didn't put in jalapeno chilies in the Yellow Pear Tomato Jam. The Jam is good. The Sweet and Sour Chicken is Mmmm... Mmmm Good Delicious! Are the tomatoes cooked down or did you put them in whole? I am not familiar with the water bath method. Can I put the jars of jam into a large pan and cover them with water. Would this work? Not something that is used a lot in New Zealand I suspect.